In a not-so-surprising move today, Marvel announced the promotion of Axel Alonso to Editor-In-Chief. Axel, an award winning editor, has been with the company for ten years, steadily moving up the ranks. Because it's hard for me to keep up with comics the way that I would like to, I had not been aware of who Axel was until last year, but then I started hearing his name everywhere. I was able to see him talk at SDCC and found him to be extremely engaging and full of ideas. You could tell this was a man who wanted to achieve a lot. After the Fear Itself press conference, it was apparent that it was only a matter of time before either he or Tom Brevoort landed in the big seat. I'm a little surprised at how quickly it happened, but I think this will be great for Marvel. Congratulations Axel! Here's to many years of great and exciting storytelling. Update - Tom Brevoort might not have gotten EiC but he has been named Marvel's Senior Vice President of Publishing. Congrats Tom! You definitely deserve it! Are you ready for some Visitors? Yes, the season premiere that I'm super excited about, V returns tonight!! Will Erica find Tyler, will Lisa take an active role in the Fifth Column, will Anna have babies?! Not to mention, Jane Badler as Diana! Find out when you tune in! 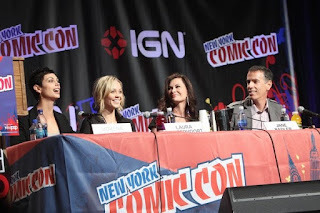 Back in November, I posted some spoilers for the upcoming season that I learned at the NYCC panel. If you want a small insight into what's to come, go read it. If not, just know that I saw some clips from the first few episodes and this season looks A-MAZ-ING! Tune in to ABC tonight at 9pm EST!